We welcome Rebecca Sweet, author and garden designer with her company, Harmony in the Garden, located in Los Altos, California. A lifelong gardener, her artistic eye and creative flair translate her design ideas into unique and engaging spaces that delight the senses year-round. With all of the buzzwords and trends in gardening these days, how do you know where to begin? 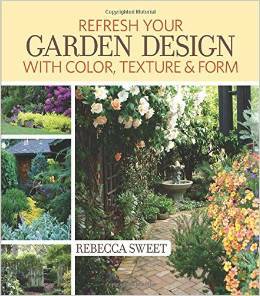 Based on her new book, Refresh Your Garden Design with Color, Texture and Form, Rebecca Sweet takes a fresh approach to explain and simplify traditional design concepts for home gardeners of all levels. You will learn how to break down traditional garden design principles into practical, easy-to-understand and, more importantly, easy-to-implement solutions. Inspirational photographs highlight and reinforce real-life situations, helping you not only to identify what has gone wrong with your garden, but how to fix the problem. Rebecca Sweet’s gardens have been featured in Sunset, Fine Gardening, Horticulture, Woman’s Day and Country Living magazines as well as many regional publications. Rebecca and her gardens have also been featured on the critically acclaimed PBS series, Growing a Greener World. She has been a radio guest on numerous programs, including Martha Stewart Living. In addition to designing gardens, she is the author of Refresh Your Garden Design with Color, Texture and Form (an Amazon Top 10 Garden Book 2013 selection) and is the co-author of the national best-selling garden book, Garden Up! Smart Vertical Gardening for Small and Large Spaces. Rebecca also shares her secrets to successful garden design in her column “Harmony in the Garden” in Horticulture Magazine. In her lighthearted blog, Gossip in the Garden, Rebecca shares inside information about garden design, gardening tips, amusing observations and how-to videos for both the novice and experienced gardener. A book signing will follow the meeting, where Rebecca will have her books available for sale.